Once was great. Twice, even better. Now, we’re doing it a third time. November 9 is Homestyle III at Peter Chang’s. 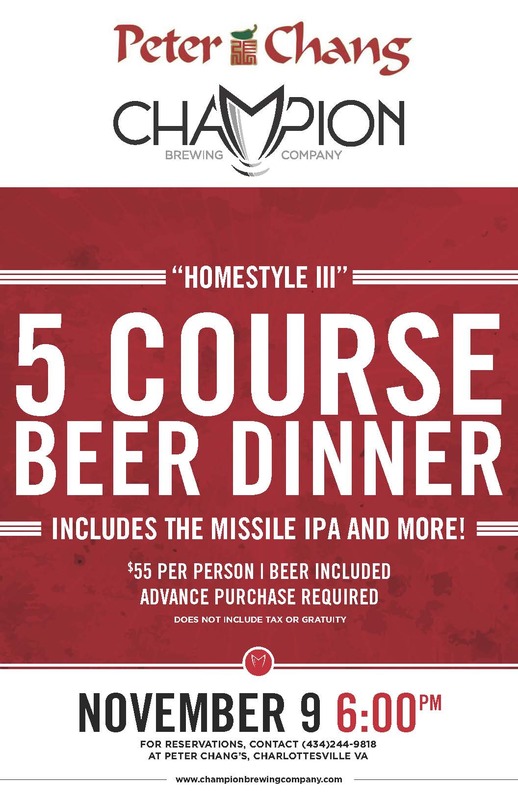 Peter Chang, one of the nation’s most acclaimed Szechuan chefs, will again serve a feast of his favorite homestyle dishes, and Hunter Smith of Champion Brewing Company will be on hand to pair each course with a Champion beer. First, an array of eight appetizers, and then five (or more) courses of main dishes, served family style. All conceived and prepared by Peter Chang, himself. Tickets for the first two Homestyle dinners sold out almost immediately. At $55, it’s no wonder. Call now for tickets. (434) 244-9818. 1. 五味 凉拌菜：麻辣藕片， 芥末白鸡， 卤水豆腐 ， 川式熏三文鱼，鱼香白菇 四热台： 干煸秋葵， 牛干巴，小椒韭.